A listing of exhibitions (such as they exist) at the Folyamat Water Level Instrumentation Building and Gallery (along the Danube in Budapest) and the water level of the Danube. We will be bringing you the water level at the Danube, plus the weather in Budapest, on an daily basis, or maybe instantanously -- as soon as we device some instrumentation which connects a mouse to the gears and cogs of the Folyamat building. Meanwhile, we will sooth your delayed gratification for panaramic views and slit-shutter camera images with some samples, shown above and below, and notice of other attempts at slit-shutter film. Hope you have a Pentium or G3 processor. (by Jno Cook) Folyamat Gallery was started by Gabor Csaczari in 1991. and maintained by him and others since. At one time or another I sent extra long fax images to support exhibitions. In that the 150 year old machine (in measuring the level of the Danube) produces a slowly moving pen chart, only a portion of which is visible at a time, it resembles the operation of a slit-shutter camera. If you do not know what a slit-shutter film (or image) is, I recommend you look at [this link] for a description and some filming applications. A combination of 35mm CinemaScope and slit-shutter camera. The two cameras were mounted together on a car and on a dolly, so that the two images are the same at the middle vertical line. With stereo sound. It was kind of a big production, shot on the 20th and 27th of May, 1990. Nine hundred meters of CinemaScope and five 100-foot rolls of slit-shutter camera film. The bigest problem was to start the cameras together with the horses. Horses are up to full speed in one second, and no car can do that. But at the 10th start we managed it, starting a bit behind, a bit earlier, and then went with them. The film should start with one single, still image of all the horses in the startboxes. The sound of the action to get them into the boxes. Wonderfully agressive. Then the start, the run, the audience, mesuering the jockeys -- great material, worked with real professionals, but run out of money, so we never finished. Also a bit forgotten. The whole film should be about 10 minutes, the two images half and half on 35mm. And then a long slit-shutter film projection by itself, coming out from the racetrack, driving to the processing lab. Now we will look all the material again, perhaps make bets, involving the car too. Finances forces made me stop, but now that I wrote about it, I once more think it should be a completed film, find a way to finance the expensive 35mm film and optical printing. It makes slit-shutter film understandable, without lecturing, and without me. "LSD," 35mm slit-shutter film(s), color, wild sound (if any), 20 to 40 minutes, 1989 with Gabor Csaszari; two films shot simultaneously from a moving window van, one in translation and one in rotation; original titles (1988) for projection on two motorized synchronized film-strip projectors "L.S.D. Rotation" and "L.S.D. Translation"
"LSD" will be presented at this summer's large-scale international thematic exhibition and event series entitled Perspective, organised by the M�csarnok (Kunsthalle), Budapest and C3: Center for Culture & Communication. The exhibition will be open between 30 June and 22 August 1999, following the vernissage on 29 June. The concurrent screening series is scheduled between 30 June and 27 August. The symposium will take place between 1 and 4 July. Will include a screening Series in the Mucsarnok and in the �r�kmozg� cinema, the Film Museum of the Hungarian Film Institute, throughout the duration of the exhibition. (by Jno Cook) Gabor had been using a slit-shutter camera since 1985. Had borrowed a finish line camera from the Omega company, when I met him in 1988 in Chicago, where he was filming people walking along the Elevated platform, shot from a window at his School of the Art Institute studio space, as well as attempting variously to add narrative elements to interior shots. Some of his work was published in "Time Photography and Perspective" (Omega, 1988? ), including a wonderful series of images taken from below the crack of a folding bridge in Chicago. I had been making random rotating slit-shutter films in 35 mm, started in answer to an RFP for the projection of a peripheral view for a railroad cab simulator. I had also worked out the mechanics (and built my own cameras) and had adapted film-strip projectors to viewing. In 1988 I met Gabor in Chicago, and he urged we do a traveling film together, using his stationary Omega camera, and my rotating home-made box, and my window van. We traveled up and down the Lake Shore Drive ("LSD"), until a lead acid battery and power inverter gave out (also home made). We had two workprints made of the original films. Gabor subsequently had someone in Germany convert a flat-bed film editor into a dual projection unit. I, on the other hand, cut both films into 12 inch strips, and spliced alternate pieces together. Gabor titled his film "LSD" while I titled my version "Lines and Loops." curator Gabor Csaszari; web janitor Jno Cook. Gabor Csaszari's image taken from below the crack in the double deck bridge at Michigan Avenue over the Chicago River, Chicago, Illinois; from "Le Sens Du Temps - Time Photographs and Perspective" Jean-Pierre Bovay (ed), Omega SA, Switzerland, 1988. 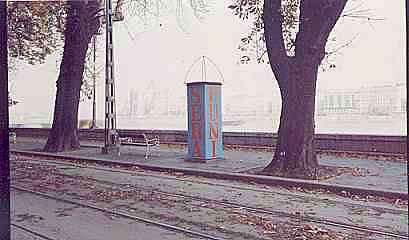 "Pyramids on the Danube" long FAX, Jno Cook 1990? "Peakaboo" digital images,zoetrope, Brock Craft, 1994. "Rollo Dog" rotoscoped 16mm film, Jno Cook 1993. "Backyard" slit shutter image, 120 gage film, Jno Cook 1991.